British theoretical physicist Stephen Hawking has died at the age of 76, a spokesman for his family reports. He was one of the most respected and well-known scientists in modern history. 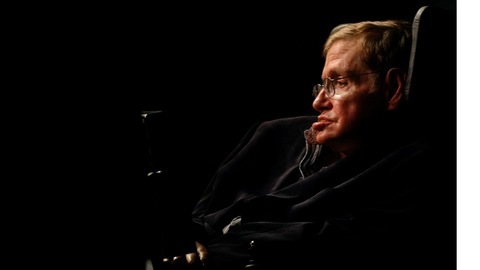 Hawking tried to explain some of the most complicated questions of life to the masses while working under the shadow of a likely premature death. He was diagnosed with the wasting motor neuron disease at the age of 21 and was confined for most of his life in a wheelchair. As his condition grew worse he had to resort to speaking through a voice synthesizer. His best-selling book "A Brief History of Time," published in 1988, made him a household name across the world, explaining complex and theoretical science to everyday people. Hawking was proud that the book contained only one math equation: Einstein's famous "E=MC squared." In his 2013 memoir, "My Brief History," Hawking revealed his disease led to the collapse of his two marriages. Hawking specialized in both the fields of astronomy and the sub-molecular world of quantum theory, which he said could predict what happens at the beginning of time–and its end. 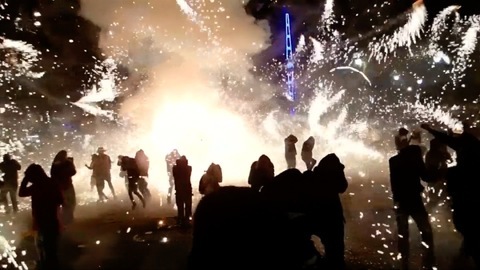 Despite a dark past, residents in Tultepec, on the outskirts of Mexico City, celebrated the patron saint of fireworks, San Juan de Dios, on Thursday (March 8). In December 2016 days before Christmas, heavy explosions at the San Pablito open-air market in Tultepec killed 42 and injured dozens. All seemed to be forgotten as fireworks "castles" in the shape of bulls, were paraded through the town streets to later be detonated. Tultepec has adopted San Juan de Dios as its patron saint -- according to local residents, legend says the saint rescued patients from a burning hospital.The week-long festival is not without its risks - every year several people suffer burns from standing too close to the fireworks. There have been several accidents that have struck the popular marketplace in Tultepec, home to the country's best-known fireworks shopping and about 20 miles (32 km) north of Mexico City in the State of Mexico. Tultepec is considered Mexico's capital of pyrotechnics -- local workshops produce about 80 percent of the country's fireworks. 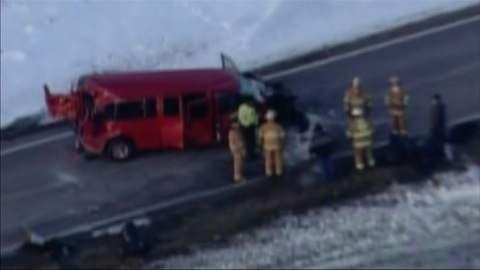 A school van and a semitrailer crashed in western Minnesota on March 12. Seven schoolchildren and the driver of the van have been injured. All eight have been taken to hospitals but details about their injuries are not clear. The children are ages 8 to 16. The man driving the semitrailer was evaluated at the scene and released. 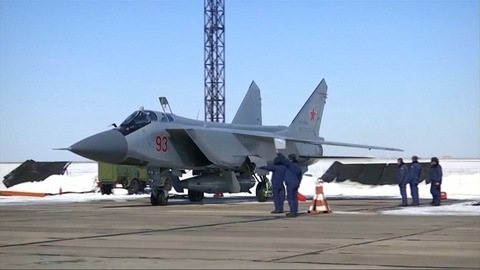 Russia successfully launched its new hypersonic Kinzhal missile as part of President Vladimir Putin's much-vaunted armaments boost on Saturday, March 10, its defence ministry said. President Vladimir Putin unveiled an array of new weapons on March 1, ahead of a presidential election he is expected to win comfortably on March 18. 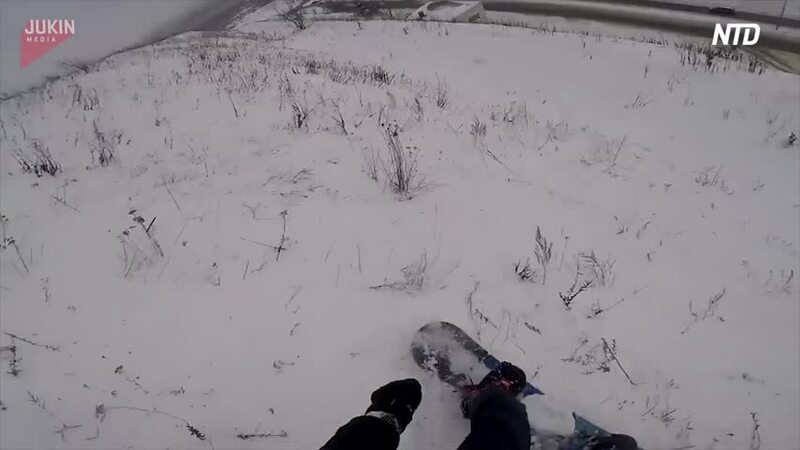 This snowboarder was having a blast shredding the slopes of a mountainside. However, he didn't know that the slope abruptly ended and almost fell 15 meters (50 feet). Luckily, he avoided catastrophe and was able to stop at the edge. In the end, he unstrapped his board off his feet and took the long way around to the bottom of the cliff to retrieve it. Two trapped whales were freed from a fishing net in the high sea after a massive effort by El Salvador authorities, the country's Environment and Natural Resources (MARN) Minister Linda Pohl said on Thursday (March 8). According to Pohl, a fisherman alerted authorities that a mother whale and her offspring were trapped in a net off the northwestern shore of the Central American country. Members of the Coast Guard and the Navy responded to the area near Los Cobanos, located the mammals and were able to free the baby calf immediately. While the mother calf still had netting wrapped around her body, she was able to swim away from the area. Authorities followed her by sea and air for 15 nautical miles to make sure she could move freely. The massive rescue effort also included fishermen, biologists, veterinarians and MARN officials. 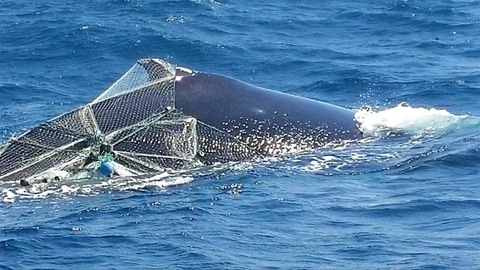 The whales were caught in a trammel net, used in commercial fishing. The World Wildlife Fund estimates 300,000 small whales, dolphins and porpoises die each year after being caught in fishing nets. Week-old square-lipped rhinoceros calf Naomi made her first foray into the outside world on Tuesday (March 6), accompanied by her mother, Kwanzaa. 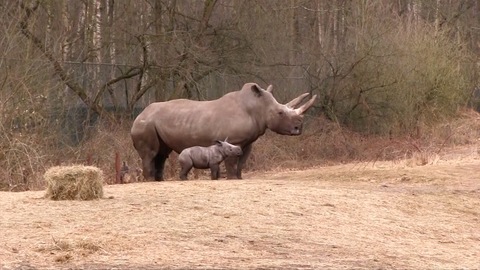 Naomi is one of three rhinoceros calves currently living at Royal Burgers' Zoo in the Netherlands, but as the youngest, she will not be on display to the public for two more months. The zoo's herd of seven rhinoceroses share their main enclosure with other large creatures including giraffes, zebras and antelopes. Naomi and her mother will be kept in a separate enclosure until the is big enough to fend for herself. A native species from the grassland of South Africa, square-lipped rhinos, which are also known as 'white rhinoceros,' face poaching for their horn in the wild and are considered 'Near Threatened' by the International Union for Conservation of Nature and Natural Resources. A mother in the US city of Bremerton fought off a man as he tried to steal her vehicle with her two-year-old son still inside. Wednesday's dramatic encounter was caught on tape by a surveillance camera. The suspect, a 24-year-old man, was later apprehended. Police said the suspect may have been under the influence of drugs. 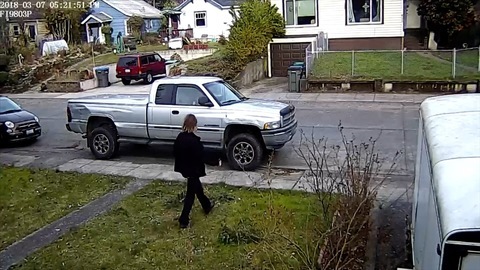 A mother in the U.S. city of Bremerton fought off a man as he tried to steal her vehicle with her 2-year-old son still inside. Members of Northeastern University women's basketball team pushed their bus back on course after it got stuck in the snow in Philadelphia. They were in the city for the 2018 CAA Women's Basketball Tournament. Possibly more impressive than them pushing the bus out though is the fact that one of them did it in short sleeves. A dramatic helmet camera video has emerged from France of a snowboarder escaping uninjured from an avalanche on Sunday. 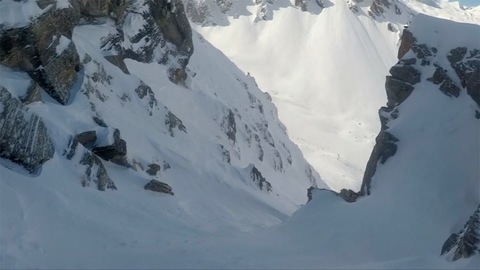 French-Lebanese snowboarder Thomas Kray was enjoying a day off piste in Tignes and hiked up a local peak known as "Petite Balme" to descend one of his favourite corridors. As the footage shows, his run down the steep corridor goes very smoothly but when the slope flattens out at the bottom the snow beneath his board suddenly cracks and an avalanche is triggered. "I fell under the snow as you would fall underwater," Kray later explained. "I tried to trigger my avalanche bag but my left hand slipped. Thank God I could reach the handle with my right hand," he added. "Once I knew the airbag was opened, I knew I was in a 'safer' position. I then tried to protect my mouth with my hand to keep space in case I was buried." "The airbag kept me afloat and I could ride down unharmed after the avalanche stopped." Kray said he decided to share the clip to show people the importance of safety equipment. A 2014 study of avalanche airbags which looked at date between 1994 and 2012 showed wearing one improved the chance of survival by 50 percent. A snowboarder escaped getting buried under an avalanche in the French Alps on Monday, (March 5), with the dramatic footage captured on his helmet camera. Lebanese Thomas Kray was snowboarding down the slope when the avalanche struck. He said he managed to launch his avalanche airbag that allowed him to float above the crumbling snow, which saved him from getting buried. Kray said he always carries his safety equipment with him when he goes on the slopes. An avalanche in the French Pyrenees swept away five Spanish skiers on Saturday (March 3), killing two, local authorities said. 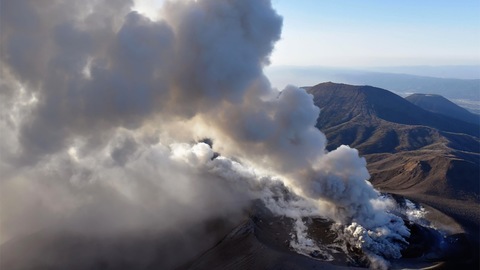 A Japanese volcano which featured in a 1960s James Bond movie shot smoke and ash thousands of metres into the sky on Tuesday (March 6), prompting the cancellation of flights to and from a nearby airport, with the eruption likely to continue for some time. Shinmoedake, in a largely rural area some 985 km (616 miles) from Tokyo on Japan's southernmost main island of Kyushu, had been erupting on a smaller scale since March 1, when entrance to the 1,421 metre-high peak was restricted. Twitter users shared footage showing smoke and ash billowing high into the sky from the mountain which featured in the 1967 James Bond movie "You Only Live Twice". NHK public television said the smoke and ash had risen as far as 3,650 metres in the peak's strongest eruption in seven years. "26 people were killed after a truck (carrying them) fell into a river near Bhavnagar (a town in west India) in the morning today, this incident is tragic. The kin of dead will be given an ex-gratia amount of 400,000 rupees ($6,000) on behalf of the Chief Minister and arrangements have been made to provide complete treatment of those who have been injured. The District Collector, Health Department and others have been informed for that. We will conduct an enquiry. This incident was very saddening." "Both the vehicles (the truck carrying passengers and another vehicle on the road) were coming in fast, like in a race. So, the truck which fell, was trying to overtake the other vehicle from one side at fast speed, and it fell down." 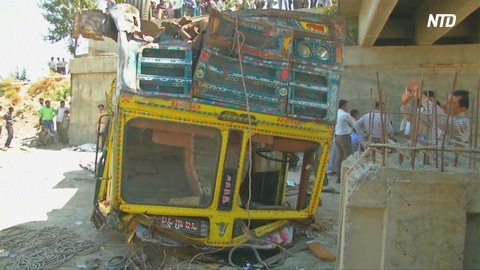 STORY: At least 26 people were killed and 12 injured on Tuesday (March 06) after a truck carrying them plunged into a drain in India's western Gujarat state. The truck which was reportedly carrying a wedding party of 60 people, toppled into a dry riverbed from over a bridge situated on the Rajkot-Bhavnagar state highway of the state in the wee hours of Tuesday. According to local media sources, the driver lost control of the truck, due to which it skidded off the bridge breaking its railing and fell down. The state administration and locals rushed to the accident site soon after the accident for rescue work, and the injured were sent to the hospital where they are undergoing treatment. Gujarat Chief Minister Vijay Rupani has announced a compensation of 400,000 rupees ($6000) for the kin of those killed in the accident and full state sponsored medical treatment for the injured. Road accidents are common in India, where roads are often of poor quality. Reckless driving and untrained drivers cause thousands of accidents a year, according to the reports of transport department. 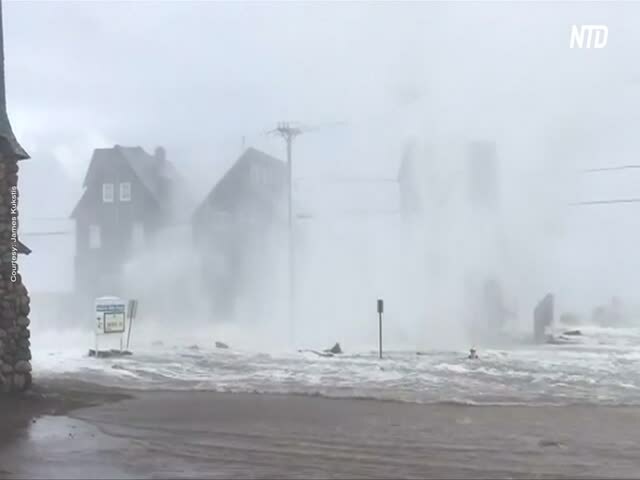 Huges waves battered coastal properties in Massachusetts in the United States at the weekend, as the northeast still faced flooding and power outages after a killer storm. 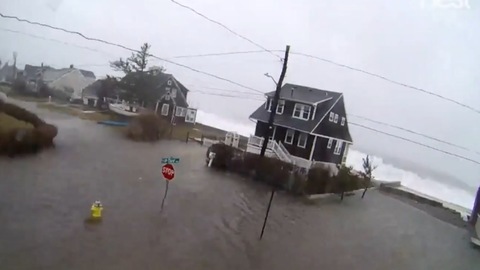 More than 1.5 million customers remained without power throughout the eastern of the country on Sunday (March 4), and communities on the New England coast faced more flooding two days after a powerful storm snapped trees, downed wires and killed at least nine people. The remnants of the storm, known as a nor'easter, lingered on Sunday with flood watches and wind advisories in effect until 1 p.m. in northeastern United States even as it moved hundreds of miles out to sea, hampering efforts to restore power. 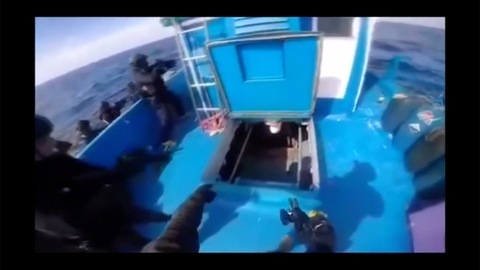 Greece's coast guard on Saturday (March 3) released footage showing officers boarding a a fishing vessel and seizing about 1.3 tonnes of processed cannabis off the southern island of Crete. The fishing boat, which had sailed from Syria towards an undisclosed European port, attempted to flee unsuccessfully and was escorted to the port of Ierapetra in Crete, where checks revealed the load of cannabis, worth about 15 million euros (13 million pounds). Its captain and four-member crew were arrested. The drug bust was the result of a three-day operation. Greek authorities had been informed by French customs that a suspect foreign-flagged ship was sailing to the southeast of the island, possibly carrying illegal cargo. The operation involved four coast guard patrol vessels and two planes, one belonging to Frontex - the European border and coast guard agency. The suspect fishing boat "Celine Star" was spotted by the Frontex aircraft about 60 nautical miles southeast of Crete. "Yeah I think since 1985 or so we are doing the Oscar parties. First Spago and now the Governor's Ball for 24 years already. So we are really all of us excited and I really think for us it's always very special you know to do that party here." "It's like a glass and you'll have a raspberry mouse right in here. And I love sweets. For me is the most important thing." 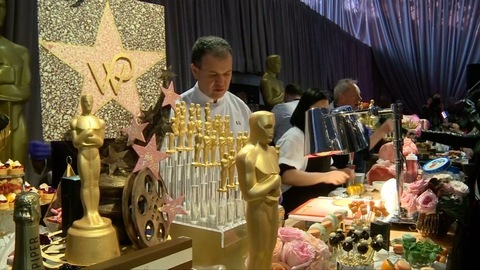 Three-hundred pounds of Miyazaki Wagyu beef will be sliced, 1,500 quail eggs cracked and some 1,400 champagne corks popped as Hollywood's stars will dine on chef Wolfgang Puck's recipes after all the Oscars are handed out in Los Angeles on Sunday. Puck, the celebrity chef in his 24th year preparing the post-Academy Awards feast, on Thursday (March 1) unveiled his menu for the annual Governor's Ball that will host 1,500 guests of A-listers and that night's big winners. "We are really all of us excited, and I really think for us it's always very special you know to do that come here," the 68-year-old Austrian-born Puck said. Diners will be treated to more than 50 dishes, including small-plate entrees such as mini pea and carrot ravioli with black truffle, a raw bar featuring caviar parfait with 24-karat gold, and cocktail-inspired macarons like negroni and mojito. The event will require a staff of more than 1,000 to prepare food, serve 800 stone crab claws and pour more than 10,900 glasses of wine from director Francis Ford Coppola's winery. Puck, who also included vegan and gluten-free fare such as spinach campanelle and tiny taro tacos, approached the event with his trademark enthusiasm, cracking a raspberry dessert with a spoon while declaring sweets his "the most important thing". Several people rushed to the aid of a man trapped beneath the snow following an avalanche on March 2 in Squaw Valley in northern California. The Placer County Sheriff’s Department confirmed that there were no fatalities or life-threatening injuries following the avalanche. However, the Squaw Valley ski resort closed as a result of the avalanche. In a video of the rescue effort people can be seen digging with their hands and with shovels in an effort to help the man. 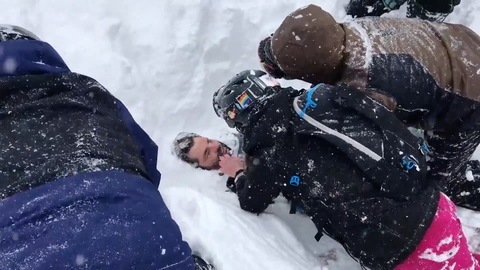 Speaking to Storyful, the person who recorded the video said that the man in blue (as seen in the footage) first spotted the man submerged in snow. He told Storyful that Squaw Valley is a client safety first resort. 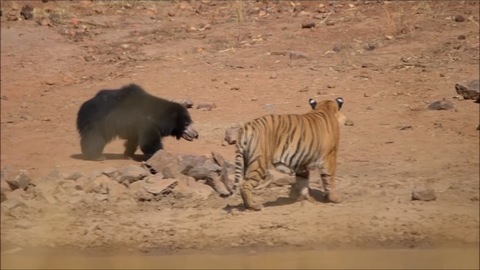 A violent fight between a male tiger and a female sloth bear at Tadoba National Park in Western Maharashtra state in India was captured on camera on Wednesday. Akshay Kumar, a naturalist leading a tourist safari at Bamboo Forest Safari Lodge managed to film the clash. Kumar said the tiger was cooling off in a water body when the sloth bear arrived with her cub. What followed was a rare and fierce encounter as the animals charged at each other, trying to force each other down as the young bear watched. Kumar said the sloth bear fought back to protect her cub from the roaring tiger who can be seen trying to get a grip on the bear through her thick fur. Both animals suffered injuries in the fight that lasted nearly 15 minutes, Kumar said. Ice skaters took a spin on frozen canals in Netherlands as bitterly cold weather gripped parts of Europe. 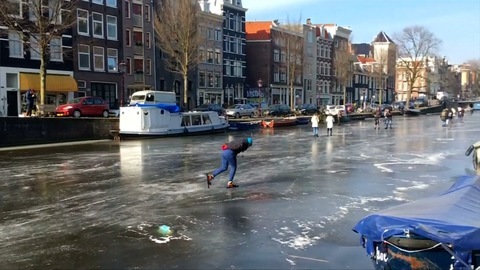 Videos shared with Reuters showed skaters gliding on icy canals in Amsterdam and Delft on Friday (March 2). The national Dutch weather institute KNMI issued two code yellow warnings for snow and icy road, with forecast of temperatures dropping below minus 15 degrees Celsius on Friday, local media reported. KNMI predicted ice will begin to thaw on Sunday (March 4). 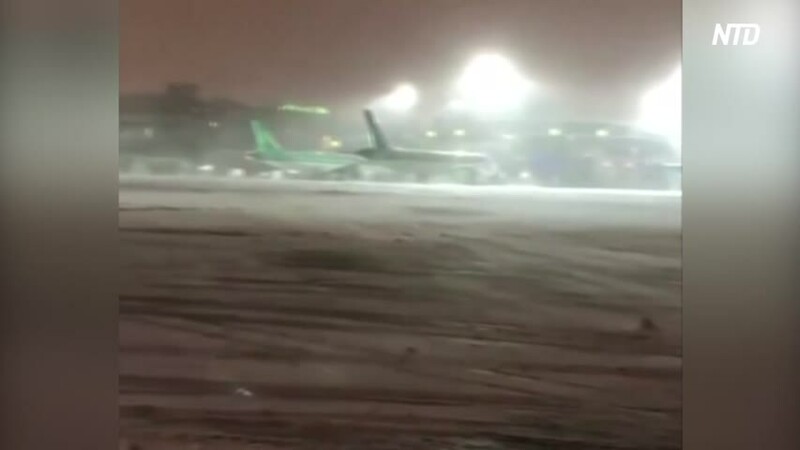 Dublin’s airport remained closed on Friday, March 2. Storm Emma is still battering Ireland with snow. Due to a red weather alert, all airlines at the airport suspended flights from Thursday to Saturday. The originally Siberian snow storm blasted through Britain and Ireland Thursday, bringing the worst weather since 1991. It has trapped several hundred motorists on roads in Scotland, closed thousands of schools, grounded planes, and halted trains. Snowdrifts left accumulations of up to 3 feet deep. At least 24,000 homes and businesses in Ireland were left without power. With the snow and temperatures as low as 13° F, residents in Scotland, Britain, and Ireland are being advised to stay at home. Texas rescue crews saved a driver stuck in high flood waters Thursday morning. The driver had to be helped out from their SUV and then walked slowly on a long pipe. When rescuers reached the end of the pipe, they put the person on their back and walked them through the high waters to safety. 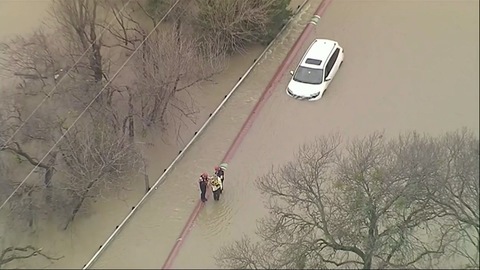 Texas authorities are warning residents not to drive any standing water. This comes as the National Weather Service issued Flash Flood Warning for Dallas and several surrounding counties. 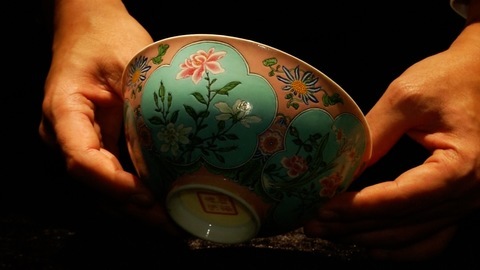 A rare enamelled gold-pink Falangcai Bowl from the Qing dynasty, expected to be a record breaker for Chinese ceramics with an estimated value of US$25.6 million, was unveiled on Thursday (March 1). The Gold-Pink Falangcai Bowl is described as the very finest enamelled porcelain, given the exquisite and fine details of the art painted possibly by Jesuits resident at the court of the Kangxi Emperor who reined from 1661 to 1722. "These Falangcai bowls were made with different color grounds and the finest and most sought after is the pink, because of its brightness, brilliance and its beauty. And there were only three produced and this is the finest together with its brother in the National Palace Museum in Tapei. ...This is the finest example surviving to this day." The bowl, a highlight at Sotheby's Hong Kong Chinese Works of Art Spring Sales 2018, had not been seen on the market for over thirty years and once belonged to celebrated collector Henry M. Knight. The sale, which will take place on April 3, will offer about 300 items with a total estimated value of nearly US$93.5 million, including various highlights such as a handscroll - estimated to be valued at least US$6.4 million. It was painted by Qian Weicheng titled 'Ten Auspicious Landscapes of Taishan'. Other items include a rare Chinese manuscript, the Buddhist Sutras, which is the only surviving example outside of the National Palace Museum in Taiwan. STORY: Formula E driver Ho-Pin Tung achieved a daring feat in China when he drove a Range Rover car up one of China's most well known landmarks at Tianmen Mountain. 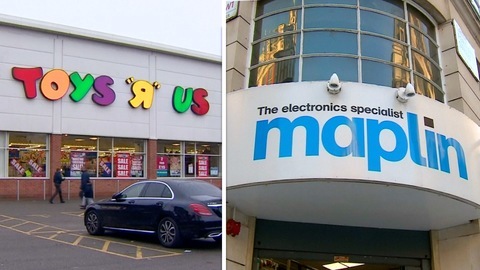 STORY: Tough trading conditions sank two high-profile retailers on Wednesday (February 28) with the collapse of Toys R Us UK and electronics chain Maplin sending ripples across the sector. The administration of the two retailers, a form of creditor protection, highlights the grim state of the UK high street, which has suffered from weak consumer sentiment, the growth of online sales and currency swings due to Britain's vote to leave the European Union. The two collapses put over 5,000 jobs at risk, and Maplin blamed the adverse economic environment. The British arm of Toys R Us has gone into administration putting around 3000 jobs at risk. The toy retailer has struggled in the UK in recent years with shoppers increasingly preferring to spend online rather than visit its large out of town stores. Those tough retail conditions also shown as electricals chain Maplin, which has 200 stores in the UK and Ireland also went into administration on Wednesday. Toys R Us is more than 100 British stores will continue trading. And administrators Maplin advisories says the company's global operations will not be affected. But the problems for retailers have also been doing damage on the other side of the Atlantic. Toys R Us filed for bankruptcy protection in the US in September. And in January, said it will shut down a 5th of its US stores in the coming months. "The bears are actually only given live fish about once a month or so and that's done intentionally so that there's novelty behind it because we don't want the fish to just be part of the environment that they see every day. We want them to have some degree of novelty for the things we provide them so that way it doesn't get boring and they interact more with it." "The bears responded greatly to the fish today. In fact, as soon as we let them out into their exhibit, the bears hit the water and they were out there fishing so that's really cool because out in the wild, polar bears don't necessarily hunt live fish so it's something that they have to identify as being provided to them and also they have to come up with ways to hunt them in this pool setting so each polar bear has their own technique when it comes to hunting fish in their exhibit." STORY: The San Diego Zoo celebrated International Polar Bear Day on Tuesday (February 27) when they released 10 largemouth black bass into the pool of their polar bear exhibit. The bears, Tatqiq, Kalluk and Chinook, who were brought into captivity after they were found orphaned in the wild, took to the water to try and retrieve the fish with varying degrees of success. 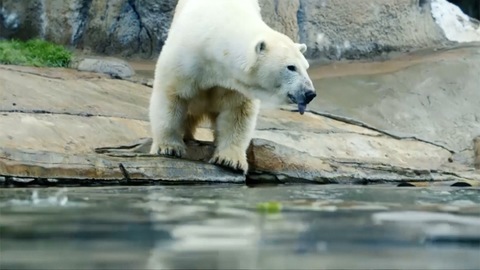 Although the stunt was to celebrate International Polar Bear Day, which was set up to create awareness of carbon footprints, senior zoo keeper, Nate Wagner, admitted they do feed them live fish every month. Usually the three bears are treated to a meat-based diet of fish, cow bones and thawed rabbits. 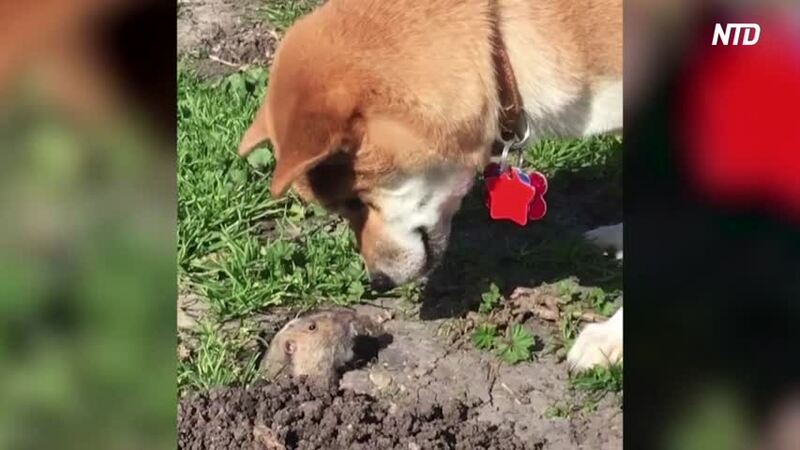 Maple the Shiba Inu was curious when she spotted a gopher pop its head out of the ground at the park. She was able to get face-to-face with it and was happy to make a new friend. Crowds gathered outside Rome's ancient Colosseum on Monday (February 27) for a massive snowball fight after Italy's capital saw the heaviest snowfall in six years. A video shot by a film student, Alessio Hong, shows the happy side of the snow storm with children and adults smiling as they play in the snow. Hong and his camera took a few hits from stray snowballs during the heated battle, but ultimately both survived unscathed, the film student told Reuters. Elsewhere in Rome on Monday (February 26), the rare snow storm disrupted transport, shut down schools and prompted authorities to call in the army to help clear the streets. U.S. First Lady Melania Trump said she has, "been heartened to see children across this country using their voices to speak out and try to create change" in the wake of the deadly shooting at Marjory Stoneman Douglas High School in Florida. Trump added that children are, "our future and they deserve a voice." The first lady made the remarks at the start of a luncheon for spouses of governors. Governors from around the country are in Washington for the winter meeting of the National Governors Association. Port authority officers in Igoumenitsa, nothwestern Greece, arrested two Bulgarians and seized nearly 10 kilograms of heroin on February 22 with the help of a K-9 police dog. The drugs were hidden in a concealed compartment under the passenger’s seat of a vehicle driven by the Bulgarians. According to local reports, 1,500 Euros, 36 US dollars and 136 Bulgarian levs were also seized. This footage shows the K-9 investigating the vehicle and the heroine uncovered. Videos of Alfie Knight, a baby born three months early making a recovery doctors thought was beyond him. Pictures of Alfie every three days of his recovery since his birth in August. A couple whose baby was born three months early, weighing less than an iPad, have opened their amazing photo album – after they took pictures of him every day, as he battled for survival. 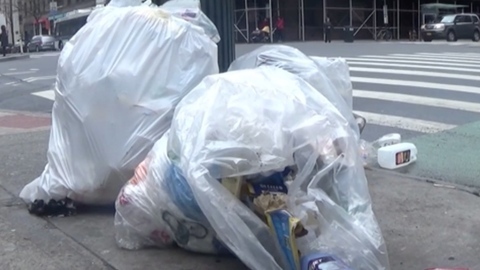 New York City has been ranked as the dirtiest city in the country. A survey by cleaning service BusyBee ranked cities based on population density, litter, pests, and air pollution levels. In recent years, NYC’s Department of Sanitation has added more trucks, street sweepers, and expanded its recycling program. In the 2016 fiscal year, the Department of Sanitation found 95% of streets met or exceeded their standards of cleanliness. With over 8.5 million people, the highest population of any US city, maybe it’s not surprising there’s a lot of trash. But locals believe there is a difference between waste and filth. U.S. President Donald Trump's daughter, Ivanka Trump, a senior White House adviser, arrived in South Korea on Friday (February 23) to attend the closing ceremony of the Winter Olympics. "It is a great honour to be here in South Korea with the U.S. delegation. We are very very excited to attend the 2018 Winter Olympic Games, to cheer for team USA and to reaffirm our strong and enduring commitment with the people of the Republic of Korea. So thank you for the kind welcome, we are excited to be here and we are looking forward to several wonderful days. Thank you." Speaking to the media as she landed at Incheon International Airport, Ivanka Trump said the U.S. delegation is looking to reaffirm their commitment with South Korea. Later in the day, the team of officials will attend a banquet at South Korea's presidential Blue House hosted by South Korean President Moon Jae-in. Her visit coincides with that of a sanctioned North Korean official, Kim Yong Chol, blamed for the deadly 2010 sinking of a South Korean navy ship that killed 46 sailors. The United States is due to announce its largest package of sanctions yet against North Korea to further pressure Pyongyang over its nuclear and missile programme, as South Korea readies itself for more talks with the North's officials. U.S. President Donald Trump's daughter and senior White House adviser, Ivanka Trump, met South Korean President Moon Jae-in on Friday (February 23) as part of a weekend trip to lead the U.S. delegation to the closing ceremony of the Winter Olympics. Ivanka Trump attended a banquet hosted by Moon at South Korea's presidential Blue House in the capital, which featured a traditional Korean music performance for her delegation. Ivanka Trump's visit coincides with that of a sanctioned North Korean official, Kim Yong Chol, blamed for the deadly 2010 sinking of a South Korean navy ship that killed 46 sailors, but a U.S. senior administration official said she had no plans to meet with the North Korean representative. Fashion designer and self-professed "pet couturier" Anthony Rubio has showcased his canine couture and womenswear fall-winter 2018 collection as part of New York Fashion Week. The show took place at the historic Angel Orensanz Center in the Lower East Side of Manhattan - the oldest surviving synagogue building in New York City, dating from 1850. Designer Rubio says his collection was inspired by Asian influences, celebrating the 2018 lunar year, the Year of the Dog. He used sequins, crystals and glass bead-work to create "a kaleidoscopic experience." Highlights of the show included a sheer vest modeled by a two-month-old Leonberger called Wolverine and a Native American fashion coat worn by a three-month-old puppy Pomsky, GreyShoes, who opened the show. A Pomsky is a cross between a Pomeranian and a Siberian Husky. Rubio's goal is to raise awareness and advocacy for animal rescue, pet adoption and pet population control. He also includes dogs that are up for adoption in his fashion shows, though some are already Instagram stars. The U.S. women's hockey team ended a 20-year drought on Thursday by claiming gold at the Winter Olympics against Canada. The game was a nail-biter, 20 mins of overtime didn't produce a winning goal. Then, a penalty shootout ended in a tie, sending the two sides to a sudden death shootout to decide who would win. That's when Jocelyne Lamoureux scored the deciding goal, followed by 20-year-old goalie Maddie Rooney's dramatic save against Canada's Meghan Agosta. Team USA went on to beat its long time rival on ice. The U.S. and Canada are the only two countries to have won gold in women's ice hockey since the sport made its Olympic debut in 1998 in Nagano, Japan. The driver of this car didn't pay attention when they were changing lanes and collided into a semi truck next to them. If that wasn't bad enough, the semi truck behind them crashed into them when they stopped in the middle of the highway. Luckily, everyone was okay in the end and only the car suffered damage. Three Egyptian police officers on routine duty saved a five-year-old from serious injury in an arresting catch as the boy fell from a third floor balcony. The officers were guarding a bank in the southern Egyptian province of Assiut last Saturday (February 17) when a woman passer-by alerted them to the child's predicament as he hung off the balcony. As the policemen tried to fashion a makeshift safety net out of a rolled-up carpet the boy tumbled, but one officer was quick enough to allow him to catch the boy in his arms. The child was unharmed, Egypt's interior ministry, which published the video shot off a CCTV screen, said, adding that the policeman sustained minor bruises to his face. French balloonist Stephane Rousson tested his pedal-powered airship on Friday (February 16) ahead of an attempt at crossing the Mediterranean Sea from Nice to Calvi in northern Corsica sometime in September or October this year. Rousson says he is the only person to pilot such a flying machine, which requires a thorough understanding of its sensitive aerodynamics to achieve the 175 kilometre journey from coast to coast. The slightest change in wind or temperature could end up being catastrophic for the pilot as it would destabilize the whole structure. The airship looks like a small zeppelin, which Rousson calls a 'zeppy', and is equipped with a bicycle-like structure, two propellers and a twenty metre long, helium filled balloon. In September 2008, Rousson tried to cross the English Channel but only managed to travel 35 kilometres after eight hours of pedalling, according to a timeline on his website. Ten years later, Rousson said he is prepared to try another journey, though his success may depend more on mother nature than his own determination. A puppy has been featured on a South Korean high school yearbook as one of the school’s administrative staff members. A photo of the puppy, named “Ttangkongi” (“Peanut” in English), is seen dressing up on the yearbook’s section for school personnel of Samil Commercial High School in the city of Suwon, south of Seoul. The school’s administrative staffers have taken care of Ttangkongi since they found him a couple of years ago, who was believed to have been abandoned by his owner, according to school officials. The officials say they will continue to treat the dog as school personnel and put his photo on the school’s yearbooks over the coming years, as long as he stays with them. For centuries, the flat-faced Pekingese was a luxury that could only be enjoyed by China's royal family. After years of turmoil and the 1911 revolution that established China as a republic, however, the dog named after the Chinese capital became available to the masses, and by the 1990s, they were so common that the streets of Beijing, formerly Romanised as Peking, were teaming with strays. But as the Lunar Year of the Dog begins this month, the most distinctive Chinese canine is almost nowhere to be found. Local pet owners today prefer foreign breeds such as poodles and Chihuahuas. "Now there really are too few local Pekingese," said Zhang Lei, a breeder in Beijing. In 2003, Zhang adopted a few stray Pekingese and since then has bred them, mostly as a hobby. Some are for sale, ranging from 1,000-2,500 yuan ($157-$394) each, but he said there are few buyers. Pekingese were first introduced to Europe when Western armies pillaged the Summer Palace in Beijing and stole several of the Qing court's dogs during the Second Opium War in the late 1850s. The breed was seen in the West as an exotic luxury and a favourite at dog shows. Although the local breed is fading from view, some Chinese pet owners are buying longer-haired imported Pekingese because of their perceived purity. "They have aristocratic mannerisms," said Beijing native Qian Hao, who takes his four long-haired imported Pekingese on daily walks in a stroller. A foreign Pekingese can cost as much as 100,000 yuan ($15,754). While there are no official statistics on domestic Pekingese ownership, Zhang Xuesong, who has bred imported Pekingese for 26 years, said that the breed's "bad genes" and a general lack of interest have kept pet owners away from the animal. After years of inbreeding, local Pekingese are perceived as having an array of health and other issues, including constant shedding, a lack of intelligence, and a susceptibility for slipped spinal discs. Wang Fei, who owns a four-year-old white local Pekingese named Jianjian, said the breed became a victim of its own popularity. "In the past, there were way too many local Pekingese. Everyone wants to raise something different. And now there are fewer and fewer local Pekingese. But I think they'll rise again in popularity," said Wang. A vast underwater cave believed to be the biggest flooded cave on the planet could help shed new light on the ancient Maya civilization, as archaeologists find ancient artefacts and animal and human bones in explorations at the site. The 347-km (216-mile) cave lies near the beach resort of Tulum. Underwater archaeologist Guillermo de Anda of the Gran Acuifero Maya (GAM), a project dedicated to the study and preservation of the subterranean waters of the Yucatan peninsula, believes explorations in the cave would help understand the development of the rich culture of the region, which was dominated by the Maya civilization before the Spanish conquest.